Towcester – UK – October 2015:Kaman’s digiVIT is a precision inductive sensor system that can measure linear distance or displacement to any conductive target with nanometre resolution and accuracy. Available from Kaman’s exclusive UK distribution partner Ixthus Instrumentation Ltd, the standalone digital variable impedance transducer provides easy set-up and calibration unlike fixed performance or analogue sensors. digiVIT calibrates itself for the specific sensor connected, the sensor cable length and whatever conductive target material is used. What sets digiVIT apart from other digital inductive linear displacement sensors systems is that all set-up functions can be accessed through 4 pushbuttons on the front panel with no need for connection to a PC – making configuration faster and easier for position, vibration and proximity sensing applications that include parts sorting, process control, laboratory test, engine dynamics testing and condition monitoring. Kaman offers a range of compatible probe models with common linear measurement ranges that have been characterised to work with an aluminium target but digiVIT will perform with virtually any manufacturer’s inductive sensor on almost all conductive targets. 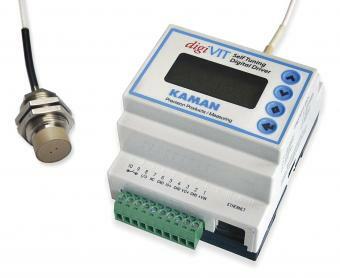 Extension cables, calibration fixtures and spacers are also available from Ixthus as part of the digiVIT range. The simple pushbutton guided set-up procedure can be configured for 2-, 6-, or 21-point linearity calibration. Simply put, digiVIT automatically detects the coil parameters of the target sensor and the built-in bridge balances the circuit - achieving optimum and repeatable performance for the calibration range and target material. Pushbutton temperature compensation and zeroing is also provided with equally simple set-up via the intuitive 4-button tactile keypad. All information is presented on an easy to read digital display that reveals percentage of full scale (default), or a choice of voltage or current output values. Analogue output options are selectable from 0-5 VDC, 0-10 VDC (default), +/- 5 VDC, +/- 10 VDC, 4-20 mA and 0-20 mA. An EtherNet port is also provided that may be used to read values and switch parameters over a network, such as the analogue output type. Ixthus works closely with leading global suppliers of non-contact sensing technologies as well as force, torque and vibration sensor and transducer manufacturers, providing a complete service with its knowledgeable technical staff available to solve customers' measurement problems - from the first enquiry to complete after-sales support..